Windows 8: Successful first date, but will it lead to marriage? Yesterday’s announcement of Windows 8, complete with tablet, at the Microsoft Build conference in Anaheim, CA, seemed to go over pretty well. Twitter was overflowing with news and the unveiling of the much-critiqued Windows 8 took up a bit of the feed. Product offerings with the new OS aren’t expected until 2012, which gives Microsoft some time to charm software developers. How, you might ask? Microsoft pulled an Oprah, handing out free tablets by Samsung to everyone in the audience. Everyone loves free stuff, but the positive reaction seemed to be genuine rather than coaxed. Perhaps Microsoft actually did its job and got developers excited about the new platform. 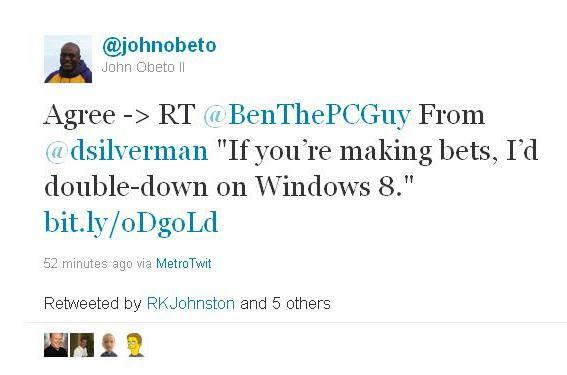 Not everyone is as enamored of Windows 8 as these twitterers, however. Blogger Daniel Dilger stands by his opinion that Windows 8 is nothing more than Windows’ old tricks, this time with “an animated web-based distraction layer.” The tablet interface is being compared to Windows Phone 7 and Zune, utilizing the tile interface. It’s hard not to compare tablets to one another, or rather to compare any tablet to the oft-considered prototype, the iPad. Beyond comparisons of look and feel or price point, developers care about the details of how development structure affects their jobs. Whereas Apple apps are written in objective-C, Windows 8 apps can be written in any language of your preference. Microsoft’s app approval process is straightforward, granting developers the luxury of actually know when their app will show up in the store, whereas Apple’s app store often comes under criticism because of its opaque approval process. On the other hand, developers prefer a platform where their app actually has a chance to sell, and less of a chance of being abandoned. With Windows 7 reaching 450 million units sold – and finally living on more systems than Windows XP – does Microsoft have enough momentum for Windows 8 to make a splash in the enterprise and in the tablet world?